In FIFA 15 this has been improved somewhat and will now keep you even more updated the ever before with the goings on with your supported teams performances, player performances, injuries, league position, comparison stats to the team that they will be playing next. You will even have news articles related to your team, which is kept up to date via goal.com. It’s all these extra additional features that will keep you immersed in your FIFA 15 experience and is something that fans will always likely appreciated, I know I certainly welcome all the added authenticity. For an even more realistic experience it isn’t just the visuals that have been improved, but the sound as well. The crowd and the atmosphere will differ depending on the city/stadium you are playing at, songs and cheering change depending on the location that creates a completely different soundscape stadium to stadium. The biggest change this year, though, comes in the form of goalkeepers. You’ve seen the adverts, and you know the score – keepers are now intelligent. It’s an interesting direction to take, albeit one that’s roughly 20 years too late to the party and should be a given in any football game. Still, the idea here is that keepers act more realistically, there are a large amount of new animations that allow for overly dramatic saves and they know when to leave their line and bear down on an opponent to close the angle. 1. New menu system is easier to navigate and much more user friendly. 2. In game tactical options, especially for set pieces, have been improved. 1. 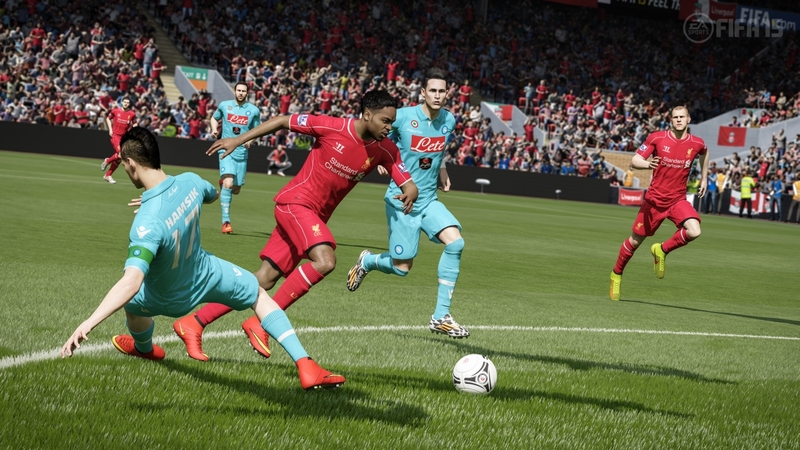 The Man-to-Man Battles and improved levels of emotion and reactions promised in FIFA 15’s gameplay are not as significant or even visible as expected given the build-up. 2. On a personal note, the continued lack of Be a Ref Mode disappoints this reviewer, but maybe next time.